Can I Spend Money & Use Checks With a Savings Account? Can You Spend From a Savings Account? Can you write a check from a savings account? How about making online purchases with that money? Can you set up recurring bill payments? The answer to those questions is generally no. Savings accounts rarely allow you to write checks for payments and purchases. It is usually easy to get a check from your savings account payable to you (the account owner), but this is essentially a withdrawal. Those checks are printed by your bank, and you don't get your own checkbook for writing checks yourself. If your bank does allow this (or you successfully set it up), it’s something you need to watch closely – you might be better off using a checking account for those transactions. If too many of these withdrawals happen each month, expect inconveniences (needing to open new accounts and change those payments anyway) as well as bank fees. That said, there are ways to make use of the cash in your savings account. The reason you can’t make payments from a savings account is a federal law that sets limits for certain types of withdrawals (Regulation D). When you’re dealing with a checking account, you can make as many withdrawals as you want by writing a check, using your debit card, making electronic bill payments, or withdrawing funds. In a savings account, those types of payments, along with electronic payments and automatic transfers, are limited to six per month (unless you do them in-person, over the phone, by mail, or at an ATM). That explains why you can’t write checks from savings accounts or use them for online shopping; without limits from your bank, you’d likely run over the federal limit, and your bank gets in trouble if you do that. There is no limit to the number of deposits you can make to a savings account. So go ahead and add money whenever you have the chance. If you want an account that pays interest and the ability to spend that money easily, you have a few choices. Interest Checking Accounts are just what they sound like; checking accounts (without the monthly transaction limit) that pay interest on your cash. Interest rates are often lower than what you can get in a savings account, but online interest checking accounts pay competitive rates. Learn more about earning interest with free checking. Money Market Accounts are like souped-up savings accounts. They pay more than plain-vanilla savings accounts, and you are allowed to write checks from a money market account (you might also get a debit card for spending). Just like savings accounts, you’ve got that six-per-month limit (and some banks lower the limit to three), so these accounts aren’t for everyday use. If you only need to write checks on your savings occasionally, they might meet your needs. The six-per-month rule doesn’t mean you have to make a trip to the bank to use money in your savings accounts. You get six chances to move out what you need for the month. Here are some ways to keep your cash accessible. Transfer to Checking: transfer what you’ll need to your checking account, and spend from that account. These types of transfers are limited to six per month unless you do them in-person or at an ATM, but with a little planning, you should be able to get enough out each month. If you don’t have a checking account, open one. Try a prepaid account if you’re unable to open a checking account at a bank or credit union. Get Cash: there are no federal limits on how often you withdraw cash from a savings account using an ATM or teller. Get a Check: if you’re not comfortable using cash, you can have the bank print a check from your savings account. If the check is payable to you (the account owner), this transaction won’t count against your monthly limit. 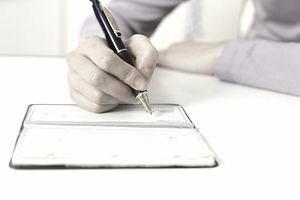 You can also request a check payable to somebody else, but check with your bank first: if it's allowed, you'll probably need to sign forms and it will count against your six transactions.